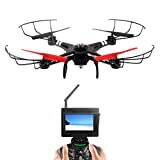 · In headless mode, no matter where the nose is, The Quadcopter fly forward to the positive direction pointed by the nose with Power As lever boost in the direction, and the other three directions are equal. · High Intensity LED Protective Covers & Durable: PPE Equipment Protection Ring, which are durable and can protect blades from fracture, is suitable for beginners; Each side of Quadcopter there are some high-intensity LED indicators that are used to help see orientation during flight. · With rechargeable lithium battery, 3.7V 730mAh, Supports about 8 minutes of flight time.